Triclosan is a polychloro phenoxy phenol that has antibacterial and anti-fungal properties. It has been used since the 1970 in a range of products including soaps, deodorants, mouthwashes and toothpastes. The aim of this Cochrane review was to assess the effects of triclosan/copolymer containing fluoride toothpastes (TCT), compared with fluoride toothpastes, for the long-term control of caries, plaque and gingivitis in children and adults. Detailed searches were conducted in the Cochrane Oral Health Group’s Trials Register, the Cochrane Central Register of Controlled Trials (CENTRAL) Medline, Embase, and the US National Institutes of Health Trials Register (clinicaltrials.gov). The usual Cochrane approaches were taken regarding, selection, data collection and analysis. 30 studies were included, 10 were assessed as at low risk of bias, 11 at high risk and the remainder at unclear risk of bias. reduced plaque by 0.47 on a 0 to 5 scale (MD -0.47, 95% confidence interval (CI) -0.60 to -0.34, 20 studies, 2675 participants, moderate-quality evidence); a 22% reduction in plaque. reduced the proportion of sites scoring 3 to 5 on a 0 to 5 scale by 0.15 (MD -0.15, 95% CI -0.20 to -0.10, 13 studies, 1850 participants, moderate-quality evidence); a 41% reduction in plaque severity. After six to seven months of use, it reduced the proportion of bleeding sites (i.e. scoring 2 or 3 on the 0 to 3 scale) by 0.13 (MD -0.13, 95% CI -0.17 to -0.08, 15 studies, 1998 participants, moderate-quality evidence); a 48% reduction in bleeding. After 24 to 36 months of use, TCT lightly reduced coronal caries when using the decayed and filled surfaces (DFS) index (MD -0.16, 95% CI -0.31 to -0.02, four studies, 9692 participants, high-quality evidence); A 5% reduction. After 36 months of use, TCT probably reduced root caries (MD -0.31, 95% CI -0.39 to -0.23, one study, 1357 participants, moderate-quality evidence). Two studies 415 participants, (low-quality evidence) show that it may have reduced the mean total calculus per participant representing a 15% reduction in calculus. 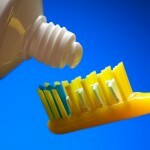 22 studies (73%) reported that there were no adverse effects caused by either the experimental or control toothpaste. There was moderate-quality evidence showing that toothpastes containing triclosan/copolymer, in addition to fluoride, reduced plaque, gingival inflammation and gingival bleeding when compared with fluoride toothpastes without triclosan/copolymer. These reductions may or may not be clinically important, and are evident regardless of initial plaque and gingivitis levels, or whether a baseline oral prophylaxis had taken place or not. High-quality evidence showed that triclosan/copolymer toothpastes lead to a small reduction in coronal caries. There was weaker evidence to show that triclosan/copolymer toothpastes may have reduced root caries and calculus, but insufficient evidence to show whether or not they prevented periodontitis. There do not appear to be any serious safety concerns regarding the use of triclosan/copolymer toothpastes in studies up to three years in duration. I am not sure that I would agree that a 41% reduction in plaque severity and 48% reduction in gingivitis were of little clinical relevance when all I would have to do is change my tootobase and continue to brush regularly.